14 cm tall (5.5 inches). 16 cm wide. Solid cold cast bronze figurine. 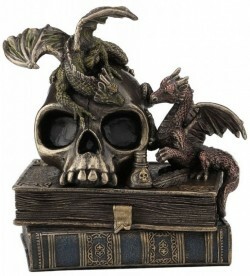 Dragons atop books and a skull paperweight. Arrives in a blue decorative box and high density polystyrene protective casing. All figurines in this range are nicely felted on the bottom.